Marquis had never liked going to the doctor. Growing up, he avoided it at all costs. Thinking back, he supposes it had something to do with witnessing kidney disease sicken his aunt until it eventually claimed her life. Ever since her death, Marquis avoided any sort of medical facility, figuring that no news is good news, and if you felt great, you probably were great. Unfortunately, Marquis’s health wasn’t great. In 2008, Marquis started getting headaches at work. 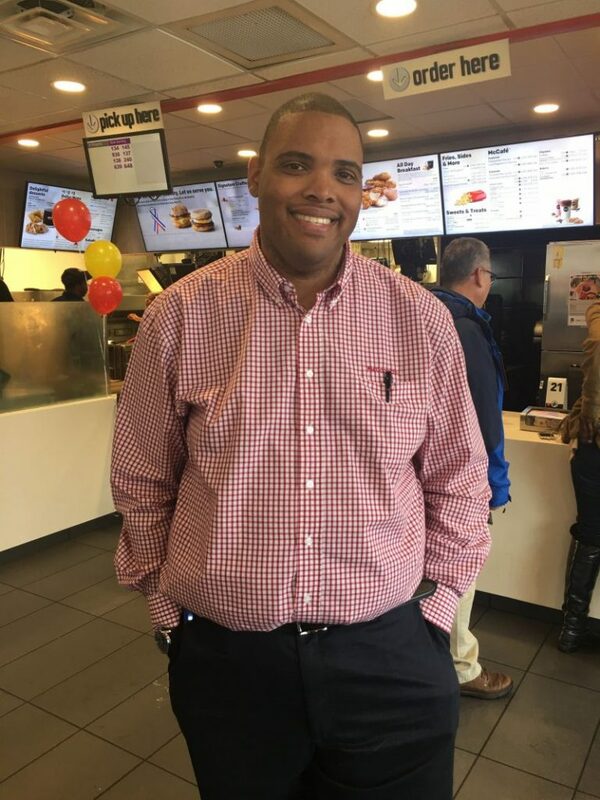 As the general manager for McDonald’s back then (he is currently the Area Supervisor), Marquis was focused on getting the job done. He’d “take an Excedrin and keep rolling.” But within a few days, he was feeling nauseous whenever he’d encounter certain things. Then one night, he laid down and couldn’t breathe because of all the congestion. That, thus far, had been the sickest he’d ever been, so sick that he worried he wouldn’t be able to get back to work if he didn’t get some rest. Marquis made a doctor’s appointment and found he had a sinus infection, but something about his specific combination of circumstances raised a red flag, and the doctor ordered some bloodwork. Unfortunately, Marquis’s health wasn’t great. Shortly after, Marquis got a call, and he was floored by the information that he’d need to see a nephrologist, as soon as possible. “It was kind of nightmarish…and I thought ‘please not me,’ he remembers. Specifically, it was his kidneys, which were only working at half-capacity. He’d known his aunt and also his uncle had died from kidney disease, but as he now realizes, there’s a feeling of invincibility that many of us have that’s based on nothing but pure hope. The dots were there, but Marquis hadn’t connected them. It was 2010 when the nephrologist told Marquis that his job was to prolong that half-capacity as much as he could, and his course of treatment did, for a little while, until high blood pressure caused his kidney function to decrease over the next three years. When he first began dialysis in 2013, he had to spend hours in a dialysis center three times a week, not to mention the preparatory surgery to strengthen his veins so that dialysis would be more effective. He would eventually transfer to peritoneal dialysis, where the liquid would be processed through his abdominal lining overnight, every night. At the start of the dialysis process, Marquis decided to look into getting on the transplant list. After waiting six months for an appointment, he was told he’d need to lose more weight, and the discouragement was both devastating and complete. That old reluctance to see doctors or to take charge of his health came flooding back and washed out all of his motivation. He carried on like this, feeling worse and worse every day. No energy. Sleeping only a couple of hours at a time. When someone mentioned to him that they’d heard the requirements for getting on the transplant list had changed, he briefly perked up, but then thought he would still have to start again at the bottom of the list. It had taken so long to even get an appointment, and there was no guarantee they’d even put him on the list. What was the point of going to all these doctors if their answers were always more and more bad news? Plus, the aunt who had died from kidney disease had had a transplant, and it hadn’t saved her in the end. He’d seen her wasting away, getting sicker and sicker with no hope, and in the back of his mind, he just was finding that vision harder to overcome. Marquis helps a colleague register as a donor online. One day, Marquis was chatting with someone at work. He happened to ask about a former colleague of theirs who’d also been dealing with kidney disease, and to his surprise, his friend replied brightly that she was doing just fine. She’d had a kidney transplant, and was off dialysis for the first time in several years. Marquis couldn’t believe what he was hearing and told his friend so. She made him a deal—or, rather, more like a command. She said she was going to ask him about it every single day until he got over his own wall of fear and made the phone call. She never needed to tell him twice—that very first day he made the call and got someone on the phone in seconds (an unusual stroke of luck). Four months of testing and appointments later, on his birthday, August 23, he got a call from VCU Health that he was officially on the list. One false start later—a kidney that didn’t work out—and then he had the real call. The “Aha moment,” as Marquis puts it, in September. “Then my family was like, ‘Now’s not the time to worry about all that stuff. Just get yourself healthy.” So I decided not to worry about it. There was no time to deliberate, anyway. There was a donor. A kidney was waiting for him. His mother met him in the lobby, and the medical personnel had him in surgery with a speed that amazed him. He woke up a few times over the next few hours but obeyed orders to rest, until one time he was awakened by something he couldn’t ignore—and hadn’t felt in years—the urge to empty his bladder. As Marquis recovered over the next few days, his new kidney “woke up” from being on ice, and he would feel that same feeling again, over and over. Though he spent much of the next several days running to the bathroom, he thought of the girl who, in losing her life, had given him such an important gift. Later, he would learn that she had also saved the lives of two others, and as Marquis got used to what it meant to feel “normal” again, he started to think more about organ donation and how put off he had been by the whole process. Marquis and his coworkers were awarded a “Certificate of Appreciation” from Donate Life Virginia. Soon, he received another call he wasn’t expecting, this time from his boss. 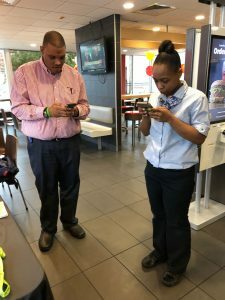 His work with McDonald’s took him to many locations, and they’d sent him flowers and cards throughout his recovery, but what he was about to hear was something new. His fellow employees were so thrilled by his recovery, but a lot of them had questions about the process and wondered how they could help. What if, Marquis’s manager said, we hosted an organ, eye and tissue donation awareness event in your honor, and you helped other people understand how they can help save lives. Of course, Marquis was touched by their concern—his boss had even reached out to Donate Life Virginia already for more information about hosting an event—but it helped him reflect on how different he felt. Not just more at ease physically, Marquis had a clearer understanding now of why he’d dragged his feet, not just to go to the doctor at all, and not just to get himself on the organ donation list, but even to sign up years ago as an organ donor himself. His experience with his aunt when he was a young child had, he decided, made a false connection between organ donation and illness. While she ultimately died, perhaps the transplant had helped his aunt more than he realized. He thought about his donor, the teenage girl who had given him her kidney and how he knew so little about her. The idea that a complete stranger could save his life was a sobering revelation. Why shouldn’t he help explain to other people that his reservations had been similar to their own, but that, because that young woman had overcome any and all reservations she had, he’d been quite literally saved? 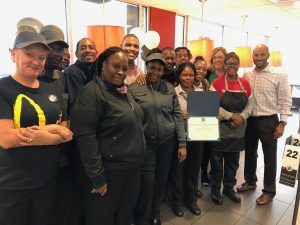 A Richmond-area McDonald’s on Mechanicsville Turnpike threw an Organ Donation Awareness Day event, and afterwards, Marquis was nothing short of beaming. He’d decided that the key is just to talk about it, and talk about it a lot. Six employees signed up that day, and plans are in motion to set up another event soon.